Lock in a great price for Sunway Resort Hotel & Spa – rated 8.4 by recent guests! 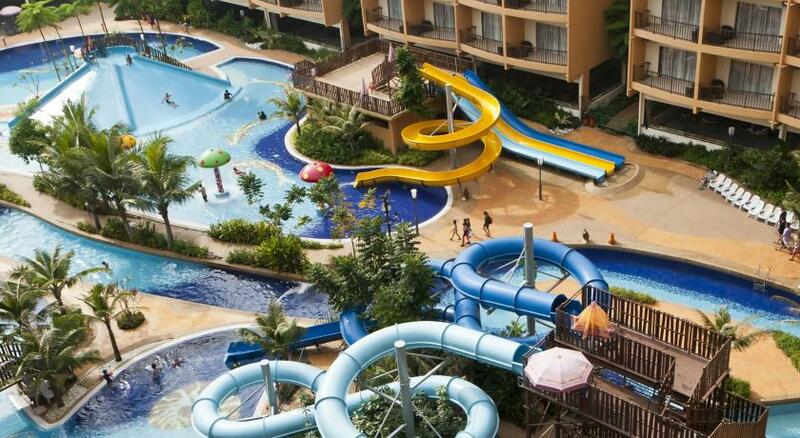 The location is just perfect for kids as it is connected with the sunway lagoon parks. I like everything the place, location and the staff as well. Everything was perfect, the location, the food and the staff. I like the green landscape at the resort location. The water park also was great option for the children. The breakfast buffet was very big including a so many kind of food from many restaurants. The resort building is huge and it is very good. Good hot water and pressure. Variety of breakfast to select. Sunway Resort Hotel & Spa This rating is a reflection of how the property compares to the industry standard when it comes to price, facilities and services available. It's based on a self-evaluation by the property. Use this rating to help choose your stay! One of our top picks in Kuala Lumpur.Relaxing stays await at Sunway Resort Hotel & Spa, which features direct access to the Sunway Lagoon Theme Park and Mega Shopping Mall. It has free parking and an outdoor pool. Union Pay is accepted here. Located within Sunway Resort City (SRC) 5-star rooms at Hotel Sunway Resort offer views of Sunway Lagoon or the resort’s skyline. They feature a flat-screen satellite TV, mini-bar and a marble bathrooms with bathtub. Toothpaste, toothbrush and toiletries are provided. Chinese tea-making facilities are provided. Enjoy full workouts at the well-equipped fitness center. Alternatively, day trips can be organized at Sunway’s tour desk. Soothing treatments await at the Balinese inspired spa after a day of activity. Sunway Resort Hotel & Spa also offers access to the Bus Rapid Transit (BRT). These electric busses travel to Sunway-Setia Jaya, Mentari, Sunway Lagoon, SunMed, SunU-Monash, South Quay and USJ7. Sunway Resort Hotel & Spa is a 25-minute drive from Kuala Lumpur City Center and a 35-minute drive from Kuala Lumpur International Airport. When would you like to stay at Sunway Resort Hotel & Spa? Offering views of Sunway Resort City, rooms feature a flat-screen satellite TV and marble bathroom with bathtub. Connecting and disabled-friendly rooms are available (subject to availability). Offering views of Sunway Resort City, rooms include a flat-screen satellite TV and marble bathroom with bathtub. Features exclusive access to The Club Lounge. Connecting rooms are available (subject to availability). Fitted with a king bed, this suite features air conditioning, minibar and complimentary Wi-Fi access. Private marble bathrooms have bathtub and rainshower facility. Features exclusive access to The Club Lounge. Rooms offer breathtaking views of the Sunway Lagoon Theme Park. Each spacious room has king or twin single beds with feathered-down comforter, cotton-rich linen and feather pillows. Features Club Lounge access. Privileges include free internet access. Concierge service provided. Offer views of the Sunway Lagoon Theme Park. Each spacious room features a luxurious king or twin single beds with feathered-down comforter, cotton-rich linen and feather pillows. Connecting and disabled-friendly rooms are available (subject to availability). Spacious suite offers access to The Club Lounge and Club benefits. It features a luxurious king bed with feathered-down comforter, cotton-rich linen and feather pillows. Nightly turndown service is provided. Connecting rooms are available (subject to availability). Each spacious room has king or twin single beds with feathered-down comforter, cotton-rich linen and feather pillows. This suite features air conditioning, a minibar and electric kettle. This double room features satellite TV, air conditioning and an electric kettle. Please note that the tickets can only be used during your stay at Sunway Resort Hotel & Spa. A welcoming ambiance, with hospitable service that begins the moment you step in. Easy access to Sunway Pyramid Shopping Mall and Sunway Lagoon theme park and a collection of guestrooms and suites to make your stay a memorable experience. House Rules Sunway Resort Hotel & Spa takes special requests – add in the next step! Sunway Resort Hotel &amp; Spa accepts these cards and reserves the right to temporarily hold an amount prior to arrival. Sunway Resort Hotel & Spa accepts these cards and reserves the right to temporarily hold an amount prior to arrival. Prices quoted are in MYR and subject to 10% Service Charge and prevailing Government Tax. A fee of MYR 400 is to be borne by guests who violate the smoke-free policy in nonsmoking guestrooms and resort areas. Please note that the theme park is open daily from 10:00 to 18:00. Please note that the hotel does not accept third-party credit card payments. Please present the same credit card used to guarantee your booking when checking in / making payment at the hotel. The staff are polite and helpful, but their response are quite slow. We came early at 1pm and despite waiting for 2hrs, the rooms were not ready at 3pm. We were told to wait for another 1hr at the lounge. At 4pm, we were frustrated to know that there wasn't any room available until I demanded for at least 1 room to be made available (I had 4 room bookings). After much persuasion, the staff issued 1 room to me and the other 3 rooms were made available within 30mins. In summary, the long wait for the rooms were unacceptable for a 5-star hotel. If it wasn't for this, I would have a more pleasant experience. However, I appreciate the staff on duty for being very patient in dealing with this matter. I wasn't furiously angry or rude to the staff, just expressing my frustration in an amicable manner. Please improve the check-in processes in future. The general cleanliness of the hotel, the breakfast was delicious and in good variety, the link access to Sunway lagoon, the spacious room. Directions is very confusing, the lift algorithm is very confusing too. As always, this hotel is the first stay hotel for most people who come to malaysia. The service as always is great and the staff are helpful. The room is clean and as expected. Facility is old, TV channel is fuzzy, and after cleaning, found hair ball on carpet. Location is great and staffs are very nice. The cupboards were dusty. The mini bar was not topped up the next day. Upgraded to suite. Conceige was extremely helpful.